The whisper of flames slowly releasing their smoke around the trees hid the excited faces until they burst, grinning and hungry, onto the logs and sat ready to listen to stories and cook their favourite treats: the humble marshmallow. The Winter Solstice and Fishponds Wood. The children have been blessed with not one but two fires this week. The Christmas party brought the first, which was a really big hit with all of Wimbledon’s children and adults, as well as those from Chiswick and Fulham. SO many smiling and messy mouths made for a very festive sight. The second was later in the week and the children were no less pleased to be collecting kindling and tinder and then wolfing down more treats! 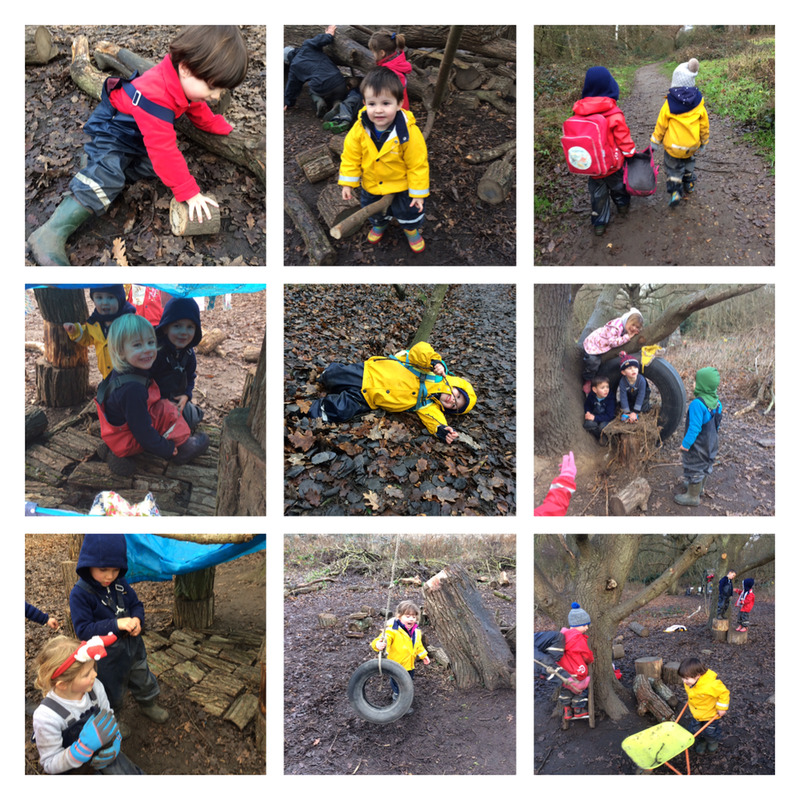 Our play has been very orientated around our feathered friends in the forest and the call of “Mummy bird” and “You can be baby bird” could be heard on most days. The branches and leaves were put to excellent use with nests springing up all over base camp and the level of detail the children put in was impressive – the real jays, magpies and robins that follow our progress each day would be mighty impressed with the results. As well as enjoying the little feeders left around the wood after the Christmas party. Mud, mud everywhere, and not a drop to drink. But a lot to play in! Swamp is an appropriate noun and swampy and apt adjective for a patch of our little woods. This area, having opened up since the plant life died back with the coming of winter, has changed daily with the children’s excavations (mud mining is a tricky occupation), splashings and additions such as logs as stepping stones and branches as bridges (the children have never had such tricky balance challenges before!). Although it’s not for everyone, those that enter do have a terrific time with the mud and potential it offers. All in all it has been an amazing year for the children of Fishponds Wood and we at Little Forest Folk are very much looking forward to seeing all our friends (and some new ones too!) in the New Year! We had such a magical time and we hope you did too! 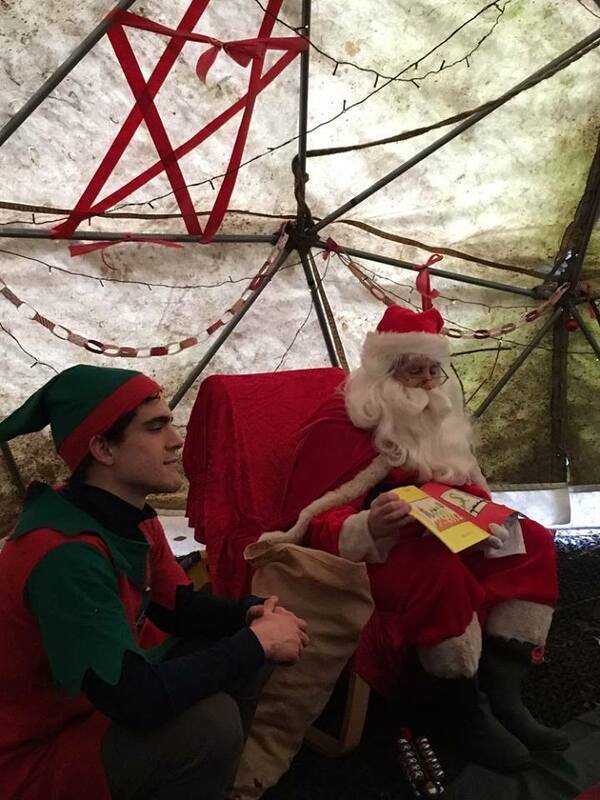 It was so lovely to see lots of you at our Forest Christmas party on Monday! Thank you all for your generous donations, through our mincemeat sales we have raised enough to give 49 homeless people a place at Crisis this Christmas! The first day back next term is Tuesday 3rd January, we look forward to seeing you all then! Little Forest Folk will be closed on Friday 6th January for an inset day. No children will be attending on this day, it is time for staff planning and training. We require annual consent to be given for all children to be transported in our Little Forest Folk minibus. If you have not yet completed our consent form can we ask you to click please complete the form as soon as possible (please check your email). The form is very short and won't take longer than a couple of minutes. Do make sure to start off the new year adventures dressing your child warmly in layers, hats and gloves. Only 2 sleeps until Christmas! We look forward to seeing your little ones for much more forest fun in 2017!